The geomagnetic field was quiet to minor storm on May 6. Solar wind speed at SOHO ranged between 349 and 489 km/s. 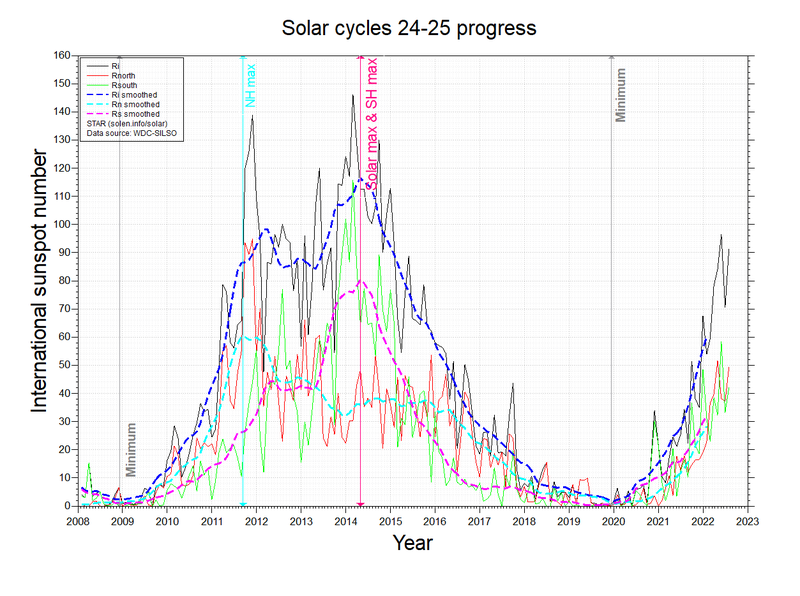 A solar wind shock was observed at SOHO at 00:50 UT, the arrival of the CME observed on May 2/3. 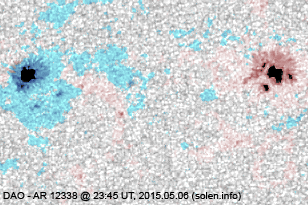 Solar flux at 20h UTC on 2.8 GHz was 136.2 (increasing 24.9 over the last solar rotation). 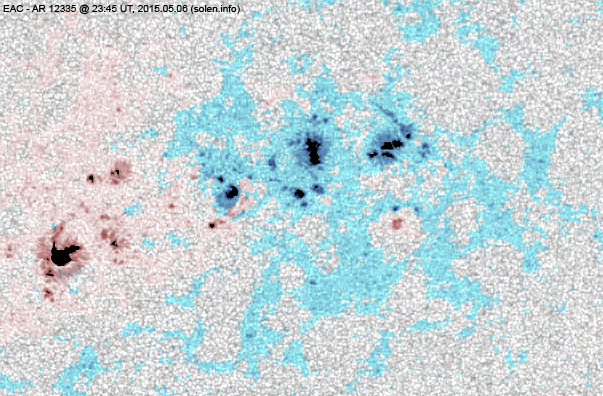 The 90 day 10.7 flux at 1 AU was 125.4. 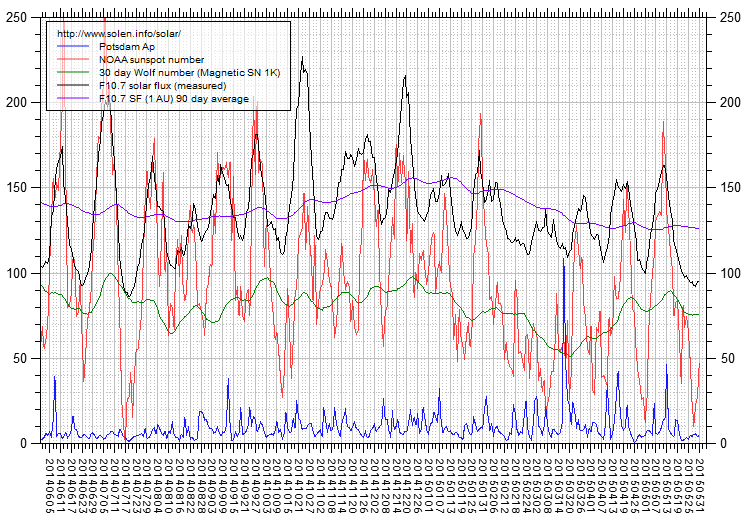 The Potsdam WDC planetary A index was 20 (STAR Ap - based on the mean of three hour interval ap indices: 20.3). 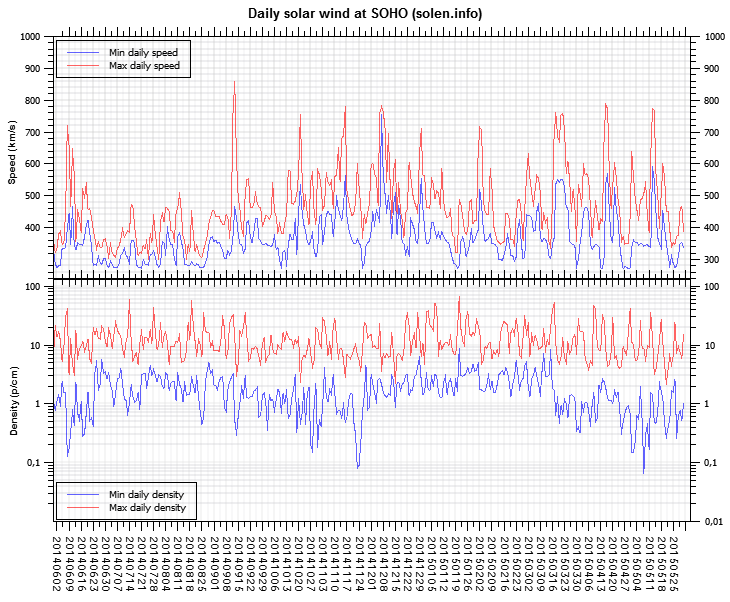 Three hour interval K indices: 33335432 (planetary), 33445422 (Boulder). At the time of counting spots (see image time), spots were observed in 12 active regions using 2K resolution (SN: 260) and 10 active regions using 1K resolution (SN: 182) SDO images on the visible solar disk. 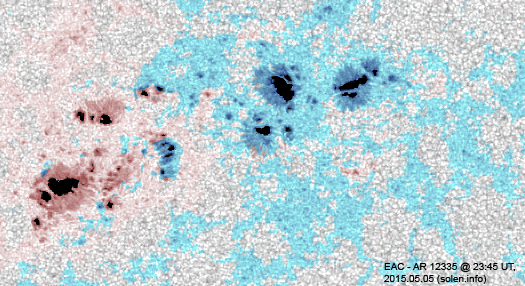 Region 12335 [S16W03] decayed slowly and became less active compared to recent days. 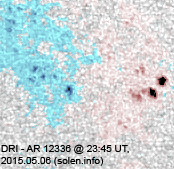 Region 12336 [N12W28] was quiet and stable. 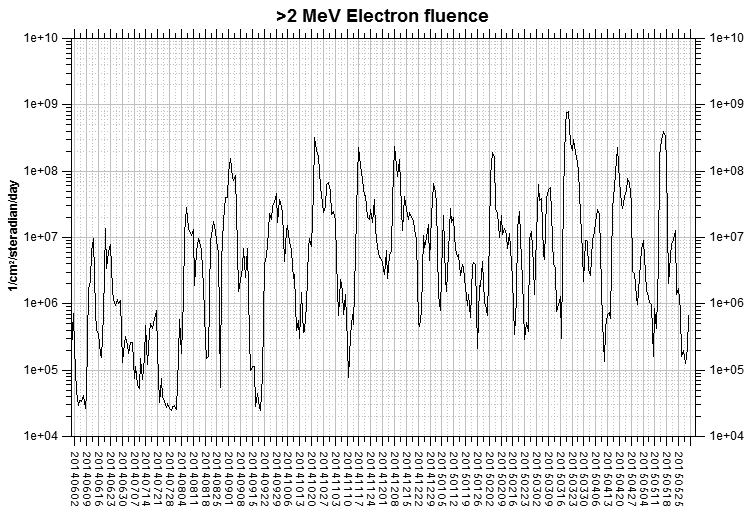 Region 12337 [S18E18] developed as new flux emerged. Region 12338 [N04E17] matured and was mostly quiet. 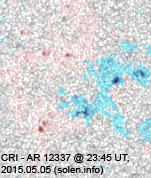 Region 12339 [N12E61] has small magnetic deltas in the central spot section. Overall the region relaxed during the day resulting in weaker flares compared to the previous day. The trailing northeastern spots are being considered for a split. S4426 [S15W27] was quiet and stable. S4439 [N12E34] decayed slowly and quietly. S4442 [S29E10] was quiet and stable. S4444 [S03E34] emerged with a penumbra spot. 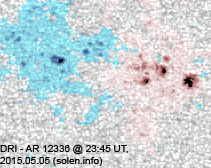 New region S4447 [S08E78] rotated into view. New region S4448 [S20E84] rotated into view. 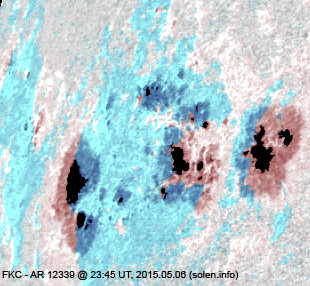 New region S4449 [N25E15] emerged with a penumbra spot. 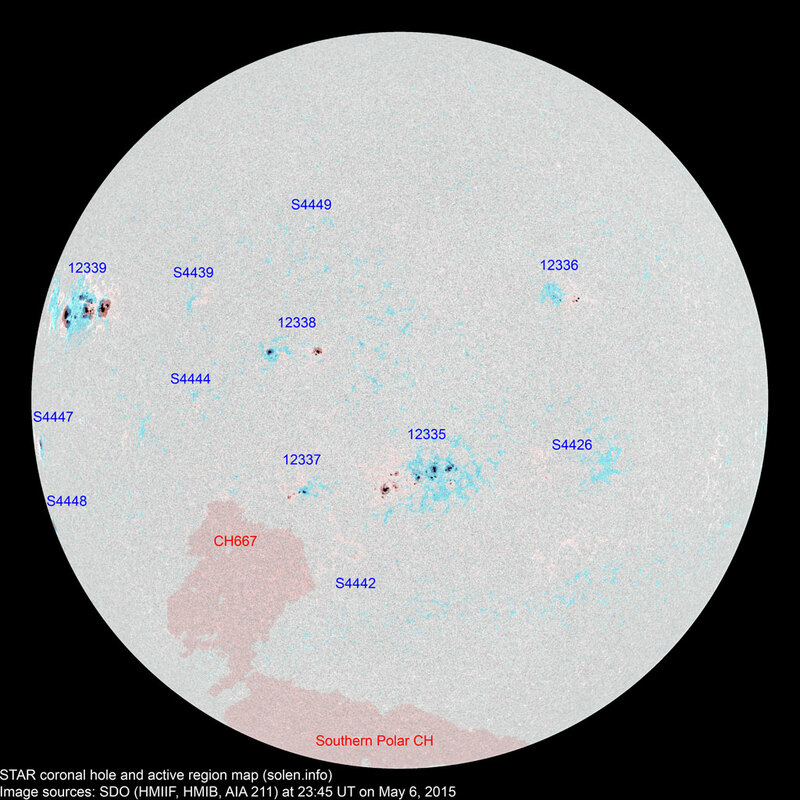 May 4-6: No obviously Earth directed CMEs were observed. 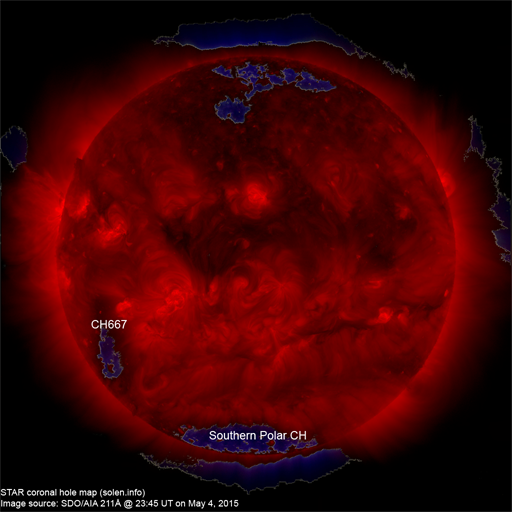 A recurrent extension (CH667) of the southern polar coronal hole could rotate across the central meridian on May 8-9 and may be associated with a co-rotating interaction region. The geomagnetic field is expected to be quiet to unsettled on May 7-9.